We routinely provide an array of surgical procedures including spays and neuters, dental procedures, soft tissue surgery, declawing and more. In addition, Dr. Timothy Lampman performs advanced orthopedic surgeries at our facility on an as needed, case by case basis. As in human medicine, prior to any surgical procedure we will perform a preanesthetic blood profile to ensure that all values, including liver and kidney, are within normal limits, as these organs are crucial in processing anesthetic drugs. Our skilled surgical technicians assist the doctors in monitoring blood pressure, pulse oximetry, carbon dioxide, heart rate, temperature and respiration. Post surgery, we perform laser therapy on incision sites to promote the body's natural healing process. This can help decrease the pain levels as well as the healing time. We will continue to monitor our patients to ensure they have as smooth a recovery as possible. 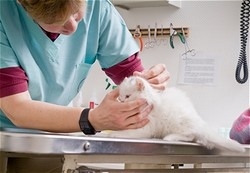 In the event that your beloved pet requires a referral to a specialist for treatment of a life-threatening illness, our doctors and staff will make sure our patients receive the best quality care and assist you with scheduling so as to make a difficult time as easy and stress-free as possible for you, our valued clients.